Two unique, secluded, one bedroom self catering cabins situated in Inverkirkaig, Lochinver, Assynt. A great alternative to bed and breakfast. Please see this years rates and how to book on the Enquiries page. Lazybed and Batbox are located either side of the owner's house, on their small 3 acre croft in Inverkirkaig, a lovely coastal settlement, a couple of miles south of Lochinver and about 40 miles north of Ullapool. This area of the magnificent North West Highlands is known as Assynt, a geographically and geologically remarkable landscape. Many of Scotland’s most individual and charismatic mountains are close by and the stunning coastline stretches north to the white sandy beaches of Achmelvich, Oldshoremore and Sandwood Bay and south to the wild, rocky coves and shell sands of Wester Ross. A multitude of trout-filled lochs cover the hinterland and the beautiful River Kirkaig, with its excellent salmon fishing and waterfall path, is only 10 minutes walk from the door. Continue beyond the falls passing Fionn Loch and eventually reach the summit of Suilven, northern Scotland’s most iconic peak. Walking, kayaking, fishing or simply relaxing, this beautiful area of Scotland has it all. Lazybed cabin sleeps 2 people maximum. 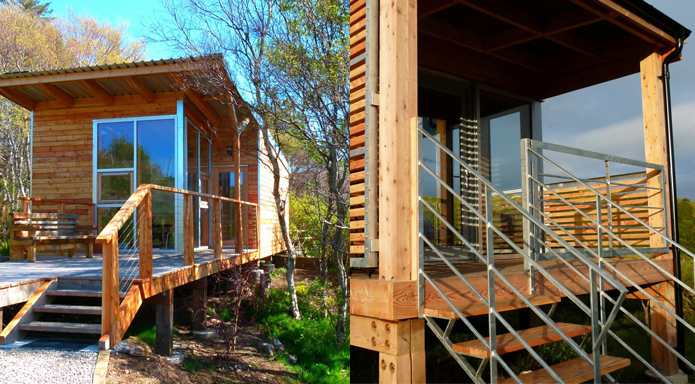 A bespoke micro-house with an interior of 31sqm, built in 2011 by North Woods Construction Ltd. utilising 100% renewable Scottish timber. The high sloping ceiling and 3 metre front windows create a roomy, luxurious, livable space tucked in amongst trees. Sheep’s wool insulates the property throughout whilst hot water is powered by a mini, Norwegian-manufactured, boiler system. The main room has a wood-burning stove keeping the cabin lovely and warm for those occasions when the weather turns inclement. The accommodation consists of a lounge / fully equipped kitchen, a separate cosy double/twin bedroom, a bathroom with a walk-in shower, toilet and wash hand basin. There is a generously sized deck area with views South West to Inverkirkaig’s tranquil sea loch and the wonderfully remote peninsular of Rubha na Breige. The Batbox cabin sleeps 2 people maximum. A bespoke studio space with an interior of 26sqm plus enclosed deck, built in 2016 by North Woods Construction Ltd. utilising 100% renewable Scottish timber. The high sloping roof and wonderful bright aspect create a roomy, luxurious space. Positioned higher up and further back on the croft with 2 metre high windows facing SSW, the cabin and deck area offer a fantastic panoramic view of Cul Mor and across Inverkirkaig’s tranquil sea loch and the wonderfully remote peninsular of Rubha na Breige. Sheep’s wool insulates the property throughout whilst hot water is powered by a mini, Norwegian-manufactured, boiler system. The main room has a Morso Squirrel wood-burning stove keeping the cabin lovely and warm for those occasions when the weather turns inclement. The accommodation consists of a lounge / fully equipped mini kitchen, a separate cosy double bedroom, a shower/wet room with toilet and wash hand basin.